Head back north through Tapu Village and heal up at the Pokemon Center here. 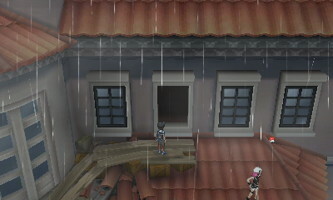 Head left to Route 15 and back to the Aether House. You'll find Hau, Plumeria, and some Team Skull grunts here. Plumeria, the Team Skull Admin, will challenge you to a battle. She has a Lv. 34 Golbat and a Lv. 35 Salazzle. She's pretty tough, but you should be able to take her out if you can get the type advantage. You'll get a Rare Candy when the battle is over. You'll also learn that you need to head to Po Town next. 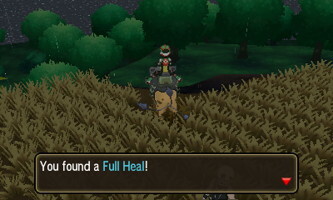 Heal up back in town if you need to, then head left on Route 15. Grab the Hyper Potion and defeat the trainer here. You'll find a Zygarde Cell on the south side of the beach that you can pick up. When you're ready, speak to the man in white. The man in white will reveal himself as Grimsley. Choose either "heads" or "tails" when he asks. 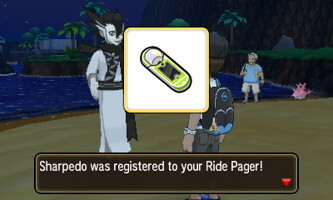 He'll add Sharpedo to your Ride Pager. Use Sharpedo to start surfing across the sea to Route 16. Smash the rocks to the south and continue left. Hop off onto the land in the middle island and defeat the trainer here. Grab TM93 - Wild Charge to the north. Get back in the water and head north. Get out on the beach on the right side of the cliff and grab the Dive Ball. You can challenge the couple doing crunches here to a double battle if you'd like. 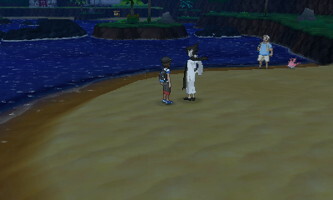 Now head to the left side of the beach and ascend the cliff to reach the Pokemon Center and heal up. During the day cycle, there is a Zygarde Cell to the left of the Pokemon Center doors. 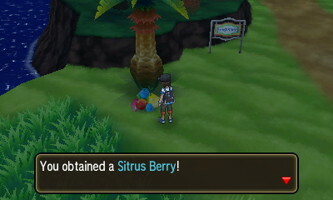 Head outside and grab the berries under a tree to the left. Head right and defeat the trainer in the tall grass. Pick up the PP Up to the right of him. 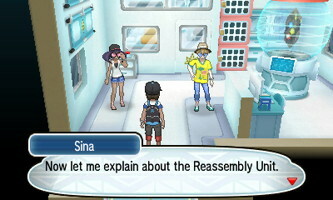 Enter the building to the right of the Pokemon Center to meet up with Sina and Dexio who gave you your Zygarde Cube. They'll explain the process of gathering and assembling Zygarde Cells and Cores into different forms of Zygarde. Crawl under the building to find TM81 - X-Scissor. Head north to Ula'ula Meadow. There will be a Zygarde Cell on the right side of the dock at the beginning of the route. Get off the dock a littler further to the north and challenge the trainer. You'll find some Red Nectar and a Repeat Ball next to her. There is another trainer you an battle on the right side of the dock. 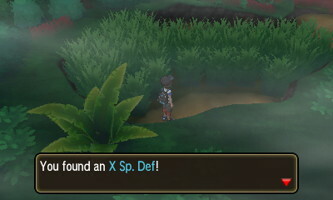 Head to the north and left side and pick up a X Sp. 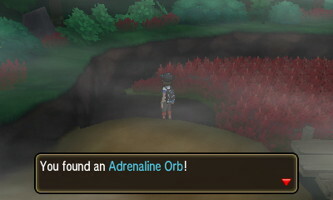 Def, an Adrenaline Orb, and some Red Nectar. You can also battle another trainer here. Head towards the exit, but swing right before leaving to pick up a Zygarde Cell. Head north and exit the meadow. 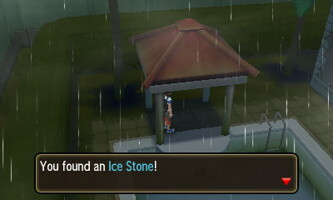 Enter the police station to the left and pick up the Zygarde Core in the back. Take the right side of the route if you want some goodies. Keep to the right to find a Lemonade, a Full Heal, and a Team Skull grunt. Hop down nut stay to the right for a Zygarde Cell. Defeat the grunt here and continue all the way down. Head south again, defeating the grunt on your way and wrap around back up to the top of the cliff. This time, hug the left side to get TM84 - Poison Jab. Head back to the bottom of the cliff and then north up the route, grabbing the Zygarde Cell on the left and defeating the grunt on the right. Keep north past the entrance at first and grab some berries from under the tree at the top of the route. Head back south to the entrance of Po Town. 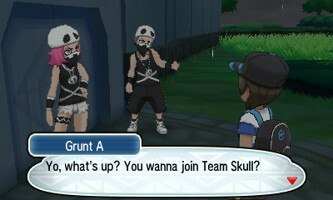 You'll be challenged to a double battle by two Team Skull grunts. After you've beaten them, a mysterious man will let you into Po Town. Po Town is the head quarters of Team Skull. 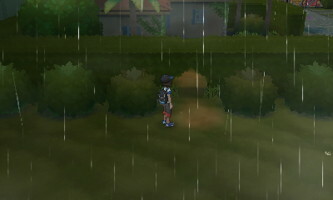 Head to the right and pick up the Max Repel from an item ball. Go back left and crawl through a hole in the fence to get past the barricade. 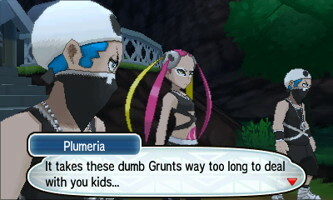 You'll then need to defeat both grunts here in battle. You can heal up at the Pokemon Center too the right, but Team Skull grunts have taken it over so you'll have to pay 10 Poké Dollars. Enter through the right opening in the fence to the north and you'll be put in a double battle against two Team Skull grunts. 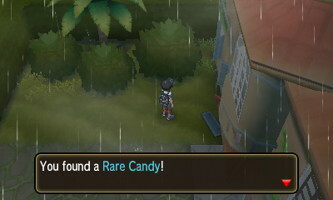 You'll find a Rare Candy in this area. Now, head back and crawl through the left opening and defeat the grunt on top of the truck. Enter through the left opening and head all the way to the right. Enter the hole in the hedge back towards the entrance of the town. In this little cranny you'll find a Smoke Ball. Head back left and defeat the patrolling grunt. You can grab a Zygarde Cell from the area up north, then head towards the doors at the end of town and enter the Shady House. Inside the Shady House, take the door on the far left to go back outside and pick up an Ice Stone. Go back in the building and take out the grunt in the left hallway. Enter the south door for a Max Revive. 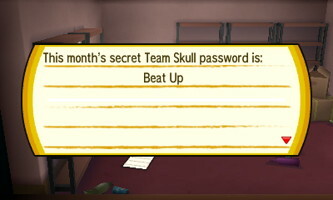 You'll find the first Team Skull password in the north door: "Beat Up". Enter the room left of the staircase and defeat another grunt. Take the door on the right and enter the next room to find a second password, "Tapu Cocoa" and a Heal Powder. Back track and challenge the remaining grunt on the first floor if you'd like. Afterwards, take the staircase to the second floor. Go left and enter the north door to find TM36 - Sludge Bomb. Next, enter the middle door if you want to battle two grunts and gain some experience. Enter the south door to face a grunt and find an Iron. 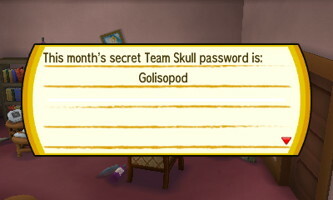 You'll also discover the third password: "Golisopod". Defeat the patrolling grunt and then speak to the grunt guarding the door to the south. Select the three correct passwords ("Beat Up", "Golisopod", and "Tapu Cocoa"), but when you're asked if you're sure, say "no". Go through the door and pick up the Escape Rope outside. 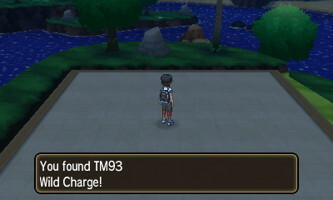 You can also battle the grunt here if you want. Either way, enter in through the window. Go straight through the next door. Inside, you'll finally meet up with Guzma. You'll battle him, of course. He has a Lv. 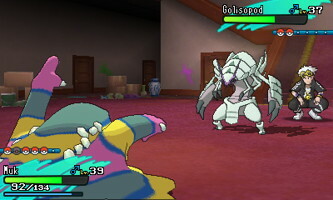 37 Goliosopod and a Lv. 36 Ariados. You shouldn't have much trouble beating him if your Pokemon are in the 38-40 level range and you've been battling most trainers up to this point. 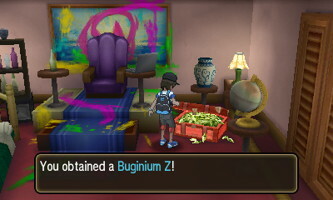 After you've defeated him, investigate the chest to get Buginium Z.
Backtrack and exit the building and a cutscene will play with the mysterious man who let you into Po Town. His name is Nanu and he is the uncle of Acerola. Fly back to Tapu Village, heal up, then return to the Aether House. A cutscene will play when you enter and it is revealed that Lillie was taken by Plumeria. 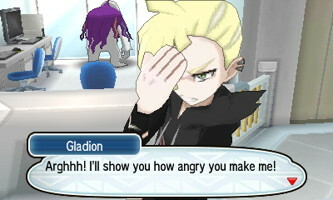 Gladion will then barge in and battle you. He has a Lv. 37 Golbat, a Lv. 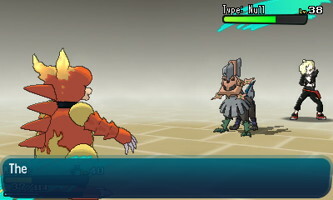 38 Type: Null, and a Lv. 37 Sneasel. After defeating him, tell him that you're ready to go with him. You'll find yourself at the Ferry Terminal and another cutcene will play. 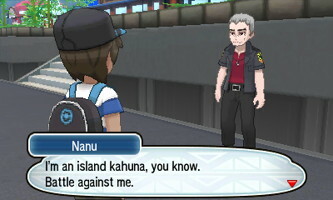 Kahuna Nanu will enter the scene and offer to battle you. He has a Lv. 37 Sableye, a Lv. 38 Krokorok, and a Lv. 39 Alolan Persian. 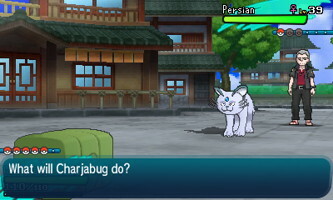 His Persian is quite tough, but is weak to Fighting, Bug, and Fairy types. Once you beat him, he'll give you Darkium Z and your Grand Trial will be complete.